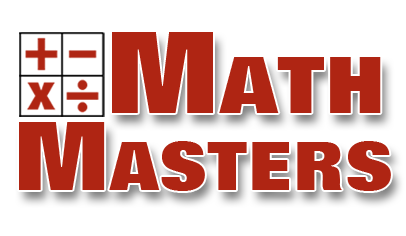 I have spent the past six years developing a mastery based algebra curriculum. My mastery tracking has evolved as I have learned more about mastery and about how my students react to this type of learning environment. 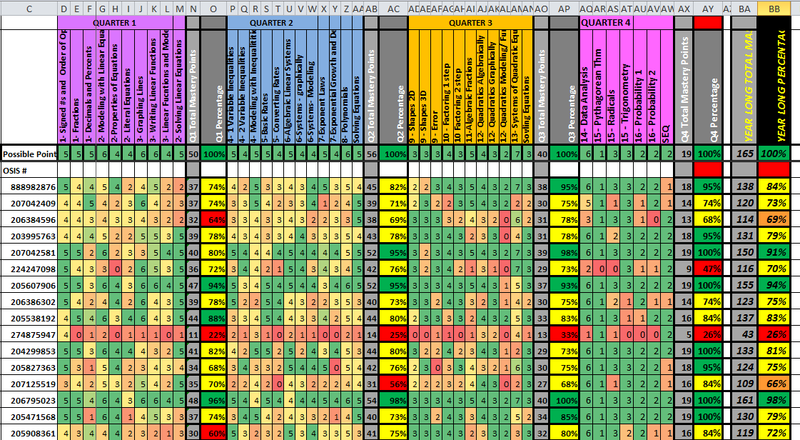 Each column in the Excel doc represents a Mastery Topic (the number in front is the unit number) So some units have 1 mastery topics and others have 3. Now, I keep track of my students’ mastery slightly differently than what has become the norm. Most teachers use some sort of scale – 4 = mastered, 3 = approaching etc… But these brings up a very big problem, what happens when a kid gets a 3 on the first assessment then a 2 on the next? Do you average it? Does the most recent score outweigh the others? It’s a conundrum. To get around this problem, I track how many times each student has demonstrated mastery on that topic. 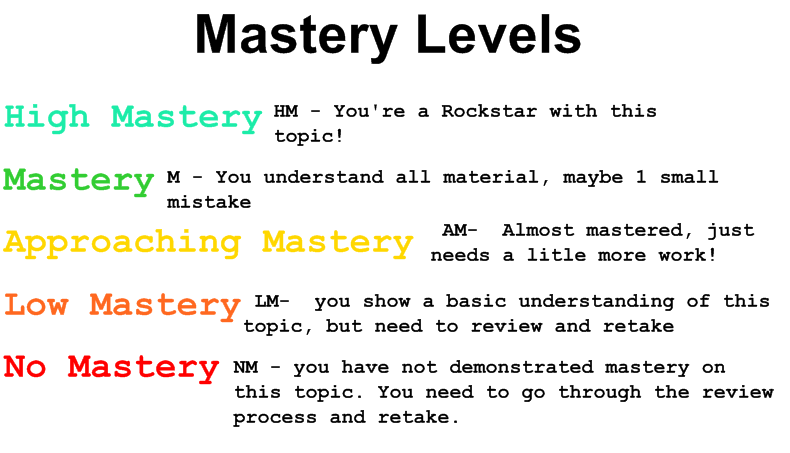 So for each assessment (a quiz, project, presentation, unit test, quarterly exam) the student either masters the topic- earning a mastery point- or they don’t. (i have set earning mastery as getting 85% of the material correct). So the numbers in the grid below represent the number of times that each students has shown that they have mastered a topic. I also keep track of the year long mastery percentage, which MUST be above 65% to pass the class- no matter how much homework the student does or what they are like in class, if they haven’t mastered 65% of the material, they do not get promoted. Many other teachers are intimidated by this screen shot- DON’T BE! I am not an excel master! There is nothing going on here that can’t be learned in 10 minutes! A Mastery Based Classroom is not something you just think about from time to time, it should be something you do everyday with your students! Please feel free to reach out and let me help you bring this amazing tool to your kids. You will see results! Students can earn one level of mastery for each topic they are assessed on. 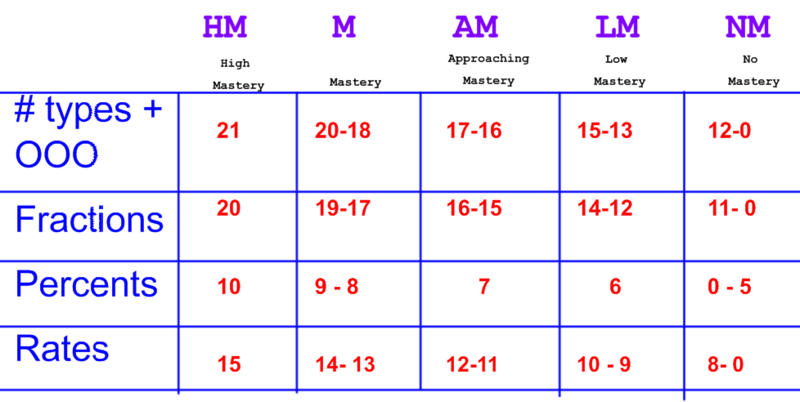 The following chart shows how we abbreviate the levels to record the grades in jupitergrades and how we determine if a student has earned Mastery or Approaching Mastery. The JG value is the percentage that actually gets calculated into the students grade. The Points column takes the qualitative mastery level and makes the data quantitative which is easier to analyze and track over time. As topics are assessed multiple times, I keep track of students data by accumulating the number of mastery points they have earned on all the assessments. This allows me to not only see the mastery level earned on individual assignments but also to see the overall mastery throughout the unit, quarter or year. When I give an assessment in my algebra class (a math unit test for example) I make sure that there are a similar number of questions for each topic that is being assessed (most tests have 3-4 topics. The test looks like any regular math test- nothing special! I grade the test and write the number of points each student earned on every question and give feedback but I do NOT total the score or write a ‘grade’ on the test. Instead, the students fill out a mastery ticket (left) in the next class. They fill in the ticket by writing how many points they earned for each problem and adding to determine the total number of points they earned for that topic. They then use the Mastery Table (right) to determine which level of mastery they earned for that topic. 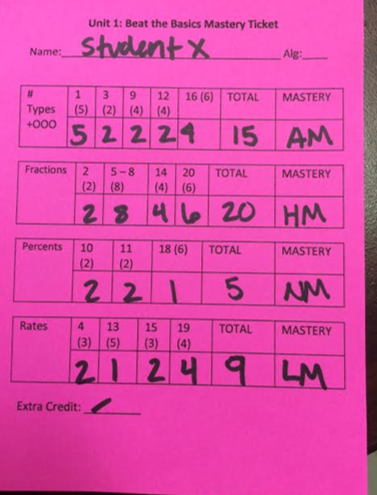 Having students fill out the mastery ticket on their own saves a ton of time for me, but it also gives them a larger sense of ownership over their mastery levels and I believe, makes them more thoughtful of where their grades are coming from. If a student earns No or Low mastery they MUST complete a test corrections assignment and retake that topic. In my class, I create a half page retake for every topic and have multiple copies ready for students to take during lunch or our office hours after school time. It is important that if kids do not earn enough mastery they have the opportunity to review and reassess. I also have short online videos that go with almost all of my mastery topics, so I have the students watch videos as additional review. You can learn more about my retake policies here. gives students a sense of ownership of what they know and what they don’t. Also, they earn the mastery! There is a LOT of front work for this type of system, you need to make topics and learning targets, assessments, tickets and tables, corrections activities, and reassessments. BUT once you do it once, you don’t have to do it again! Interested in doing this in your own classroom? Step by step process to creating your own mastery system!! MASTERY BASED LEARNING IS THE BEST! YOU CAN DO IT! CONTACT ME!